A home security electric fence is widely used in almost every part of the world. It is very effective and reliable in the sense that anyone attempting to vandalize or tamper with it, gets instant electrocution which could be fatal. Most people put up the electric fence mainly to keep the burglars away. It works very well with homes that have a stone walled perimeter wall, all around. When you, the homeowners have this in place, it give you some psychological satisfaction of being protected and this way, you will be more confident even when leaving the home for work, shopping or vacation. Our mission is to provide our client’s with a custom made high quality fence at a reasonable price. To deter people or animals from crossing a boundary. To protect the people inside the perimeter. The structure must be secure and of appropriate height. The voltage must be as high as permissable within legal requirements. Should any inteference with the fence be detected, a warning alarm that is part of the energizer must go off. The alarm can be linked to armed response for additional security. Where do we need electric fences and electronic fencing in South Africa? As a boundary protection at government properties. To protect the perimeter of factories. For game farms and nature reserves. To secure the farmhouse and buildings on farms, plots and small holdings. All wires to be energized. Each energizer can independantly be switched on or off. Manageable control of guards - they are forced to visit the affected zone. Energizers can be repaired at the location, avoiding waiting periods. Energizers can be linked to cameras and access control to form a completely functional, integrated system. What makes an electric fence installed by Secure All Security different? We use only square tubing poles with at least seven strands. We only buy equipment from reputable manufacturers. You have peace of mind allowing the staff of Secure All Security on your premises. We do not use temporary staff and you can have peace of mind allowing the staff of Secure All Security on your premises. We take utmost care to do our installations neatly and according to your specifications. Electric Fence Installation Professional And Affordable Electric Fence Installation Services If you are looking to improve on your security set up then it’s time to consider professional electric fence installation. Secure All Security is a Pretoria based company that offers affordable and reliable electric fence installation that is guaranteed to promote security at your home or office. Electric fences are the first point of contact that criminals usually have when confronting a security system. You will need to make sure that it is enough of a deterrent to keep you, your loved ones and valuable possessions safe. Electric fence installation is usually done at game farms, government premises, private homes, schools, complexes and estates. They are generally installed to keep intruders out and to ensure the safety of those within the perimeter. An effective electric fence is usually quite high and the voltage should be set to as high as possible within the legal voltage restrictions. An alarm siren is usually attached to the energiser so that you can be made aware should the fence be tampered with. In many cases this alarm is linked to armed response with the electric fence installation so that back up assistance can be made available should your security system be compromised. With electric fence installation Secure All Security first take the time to manufacture a large portion of the materials used to make up their electric fences. This ensures that they are able to keep the cost of the fences at a competitive level. The company believes in looking after the best interests of the client and as incentive they provide a free service on their electric fencing for every client referred to the company. Ensuring that you feel valued as a client and completely safe at all times is a priority for this particular team. Electric Fencing Step Up Your Security By Installing Electric Fencing Today Living in South Africa is not supposed be about cowering behind locked doors and heavy security gates. If you love the outdoors and want to enjoy the beauty of your surroundings, whether it be taking a walk in your own garden or entertaining friends around the braai, you are going to require some form of security. Electric fencing is a popular form of security used at both private residences and business premises. Electric fencing is the first security barrier that criminals will encounter when trying to break into a property. Custom made high quality electric fencing is usually available at reasonable rates from leaders in the market such as Secure All Security. The function of electric fencing is quite simple – keep the intruders out and ensure the safety of those within the perimeter. You will need to make sure that your fence is high enough to ensure that intruders cannot jump over it. There are legal limitations on how high you can set the voltage on your electric fence. Make sure that your electric fence is set to the highest possible setting within these legal restrictions. When having one of these fences installed make sure that an alarm is linked to the fence to alert you should the voltage or fence in general be tampered with. Electric fencing is commonly found at game farms, schools, complexes, private homes, estates and even government properties. Each electric fence constructed and installed can be done so according the clients specifications and requirements. Simply chat to the team at Secure All Security who will be more than willing to assist you. They will even sent a consultant to your premises to advise you on the type of fence you will require and provide you with a quotation. Electric Security Fence Have An Electric Security Fence Installed For Added Security If you like to have the peace of mind that you are completely safe within the grounds of your home or business then you should have an electric safety fence installed. Secure All Security is a company that takes the safety and security of their clients very seriously. While they install top quality security fences they also manufacture a great deal of the materials used to make up the fences which means that you will be provided with the best rates available on the market. Competitive rates for their electric safety fences aren’t all that make this company a popular choice. Professional advice and a reliable after sales service ensure that customers remain loyal and singing the praises of this particular team long after their security features has been installed. An electric security fence has limitations, by law, on how high you can set the voltage. If you are having an electric security fence installed at your home of office, make sure that it is set to the highest legal voltage possible. This will ensure that it is less possible to tamper with the fence. Tampering is also limited by attaching a siren to the energiser of the fence. If the electric security fence is tampered with the siren will be triggered and you will be alerted. Armed response services are usually attached to the fence to ensure added security too. Secure All Security is a well established company that is run by a team of security professionals who take the safety of their clients and their possessions very seriously. Each and every electric security fence that they install is designed to offer optimum security and tested numerous times to ensure its reliability. Electric Fence Installation Pretoria Find Out More About Electric Fence Installation in Pretoria One of the most common purposes of electric fence installation in Pretoria is for protection as the fence creates an electric shock barrier between potentially dangerous trespassers and the people within the protected area. Throughout South Africa these fences have become the last resort for many homeowners in order to stop unwanted visitors from entering their homes without permission in order to carry out illegal activities such as theft, or worse. Many businesses also require electric fence installation in Pretoria in order to keep their company’s premises and staff safe. Usually they are required put up visual warning displays such as signs to warn off intruders and discourage them from trying to break into the area. If the intruders decide to ignore the displays and are still not put off by the buzzing sound of the electric fence, they will have no choice but no suffer the consequences of their crime. The strong construction of a high voltage electric fence is more than often fully fitted with an alarm that activates when the fence is tampered with. In addition, the fence’s alarm can be linked to armed response to provide further protection to the home or business owner’s property. If an electric fence is already but does not perform properly, it can also be upgraded to better suit the necessary security requirements. Secure All Security has conducted extensive research into their electric fence products in order to create reliable and long lasting security solutions. Their products can be specially-made to suite your individual requirements and provide sufficient protection to your business or household. Electric Fence Installation Different Types of Electric Fence Installation Solutions for Home and Business Use Electric fence installation is used to create a security barrier to protect those within the secured perimeter. Unfortunately, this type of barrier has become a requirement for many home and business owners in South Africa due to the high rate of crime in the country. Electric fences have had a high success rate by those who use them as a protective mechanism. The strong structures hold a high voltage of electricity and are fully equipped with an alarm that activates when the fence is fiddled with. The alarm used on the fence can also be linked to armed response to provide added protection the home owner’s security. Besides home residents and businesses, other places that commonly make use of electric fence installation are housing estates, farms, small holdings and even game farms. In addition, there are different types of electric fencing options available such as fencing specifically for brick and precast walls, sliding gates and palisade fencing. This type of electric fencing is installed by using poles that are bolted into the wall to which the electric wires are attached, while freestanding fences are fitted directly into the ground. If on the other hand you already have an electric fence but are not happy with how it is performing, you can have your fence upgraded to better suit your needs and security requirements. Electric Fencing Gauteng High Quality Electric Fencing in Gauteng In South Africa, keeping ourselves and our family’s safe is a reality that we have to face every day. The luxury of not having to worry about locking doors and closing windows is not something that we can enjoy, and although it may not be picture perfect, electric fencing has become part of our daily lives. Electric fencing in Gauteng is available from Secure All Security who offers a wide range of security solutions for both home and business owners. With the dangerous threat that the high crime rate poses onto all of us, Secure All Security has created a security solution that is both affordable and effective. The company also has a wide selection of electric fencing in Gauteng that can be fitted to everything from sliding gates, palisade fencing and brick and precast walls. The electric wires are secured into the wall by using thick, strong poles and bolts, while their range of freestanding fences can be installed directly into the ground. However, if you or your business already makes use of an electric fence, but you are not happy with the results, the team of professionals at Secure All Security can carry out an upgrade to ensure that it performs in a way that you are happy with. In addition, there range of electric fencing can also be used on farms, small holdings and even at game farms to keep the animals within the protected perimeter safe. Electric Fencing Prices Affordable Electric Fencing Prices If you are looking for a highly recommended and affordable security solution then look no further than Secure All Security Systems. Based in Pretoria, their electric fencing prices are reasonable without compromising on quality. In South Africa electric fences have become a necessity. Secure All’s fencing can be used on all types of businesses as well as households, keeping the individuals within their fence’s perimeter safe and out of harm’s way. As an extra safety measure, their fences are also fitted with alarms which can be linked to the local armed response. One of the main things that help Secure All Security keep their electric fencing prices down is the fact that they manufacture many of their own materials. Despite being lower in cost, their products are all heavy duty and are made with only square tubing poles, using a minimum of seven strands used, making it impossible for an intruder to simply climb over the fence. If you already have an electric fence fitted onto your property that you are not happy with, Secure All can easily alter it to suit your needs. Although your electric fence is bound to require some form of maintenance in its lifetime, you can rest assured that Secure All Security will tend to all matters swiftly and professionally. This is one of the reasons why all of their referred customers are offered a free service call. Installing Electric Fences Installing Electric Fences in South Africa Installing electric fences in South Africa has become a common practice for the majority of home and business owners, due to the countries high rate of crime. The professionals at Secure All Security understand the importance of having an effective electric fence and security system in place, which is why they offer a reliable, high quality service to all of their customers. The company prides themselves in the fact that they are able to offer highly competitive prices, due to the fact that a large amount of the material used in their products is manufactured in house. They make use of heavy duty gates and circuits to ensure that their systems are durable and long lasting, using only square tubing poles and a minimum of seven electric strands. This solid construction will guarantee it impossible for any intruder to successfully climb over the fence. All Secure All Security's fencing is professionally installed and for all referred clients there is a free service call. They have been installing electric fences on various types of properties for years, from homes and businesses to farms, housing estates and game reserves. Their fences can be built directly into ground or fixed onto fences that have already been constructed. Furthermore, if you already have an electric fence but are not happy it, Secure All Security can upgrade it to better suit your individual security requirements. Electric Fence Installation Safety First with Electric Fence Installation Many homeowners want to provide top class protection for their homes which will ensure that their assets are secured against theft and their families are safe from harm which can be caused by intruders. For this reason one of the first lines of defence for any homeowner is electric fence installation. Electric fence installation is both quick and offers exceptional value for money as a method for securing domestic dwellings. The installation of electric fencing should be undertaken by qualified technicians due to the fact that the voltages involved in the erection of the fencing can be potentially harmful. Electric fence installation can be undertaken where there is an existing wall on which to install the fencing or in the absence of an existing structure the electric fence can be freestanding. The guiding principle is that the electric fence should be high enough to deter potential intruders and prevent tampering with the fence or its components. Another consideration when installing electric fencing is to ensure that the fence is supplied with enough voltage to ensure that the fence is tamper proof. Consultants also often recommend that a generator or alternative power supply such as batteries be installed to ensure that current is continually supplied to the fence in the event of a power failure or interruption of the electrical supply to the fence caused by interference with the power lines that supply current to the fence. Electric fence installation is not limited to domestic housing only. There are electric fencing security solutions that can be employed to protect the contents of factories and warehousing as well as electric fences that are installed at game farms to both prevent game animals from straying outside of the boundaries of the far, and to prevent poaching. Similar electric fences can also be found in agricultural settings such as cattle farms where the fencing keeps animals secure and prevents stock theft. When a security company is advising homeowners on electric fence installation the consultants often recommend that the electric fence be connected to an armed response company. This provides an additional level of security when the electric fence is breached or tampered with and means that the homeowner does not have to rely on a sometimes stretched municipal police service as a first response to a break in. In order to ensure that electric fence installation is professionally completed those wishing to install these fences should take advantage of the expertise offered by installation professionals such as those at Secure All Security who will be able to advise the homeowner on which security system would best suit their individual needs. Electric Fences Pretoria Why Fit Electric Fences In Pretoria? Many homeowners in South Africa have been reassured by the latest crime statistics that have been released by the police authorities, however unacceptable levels of burglaries and break ins are still part and parcel of living in south Africa. Often these burglaries are accompanies by harm to the inhabitants of residential areas so homeowners are turning to domestic security companies to make sure that their homes are safe. In Pretoria electric fences have proved themselves to be highly effective in preventing break-ins, especially when combined with other home security solutions. The prevalence of electric fences in Pretoria is due to perceived high crime levels in the city. Many homeowners have the electric fencing installed in order to save on their insurance premiums and the installation of the electric fencing can also have a positive effect on the resale value of the property. When installing electric fences in Pretoria it is always preferable to turn to professionals who have a good track record for the installation of proven home security systems. Often the installation of electric fencing is only one part of a complete home security system. Many companies that install electric fences will also recommend additional security precautions such as the installation of cameras, security lighting, access controls and other systems that boost the effectiveness of the electric fencing. One of the ways to ensure that the electric fence is effective is to make the fence high enough to prevent tampering with the components that may result in the malfunction of the fence. 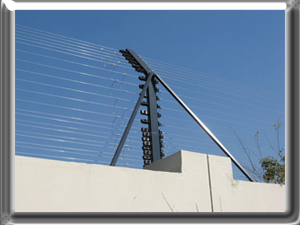 Electric fences can be installed on top of existing walls; however free standing electric fences can also be installed by security professionals in the Pretoria area. These professional installers of electric fences in Pretoria will often recommend that the electric fence is connected to both an audible alarm and an armed response company which will provide quick assistance in the event of a break in. These armed response companies will often be able to respond more quickly than local police services which can be overstretched during high crime periods such as weekends. In order to ensure that electric fences are correctly installed in Pretoria and the surrounding areas it is always preferable to use an accredited security company like Secure All Security which will be able to offer expert advice on both the electric fencing and other security precautions that will ensure the safety of family and prevent theft. Electric Fencing Gauteng Peace Of Mind With Electric Fencing In Gauteng Although the recent crime statistics that have been released by the South African police services show that many categories of crime show an improvement many homeowners would like the added peace of mind that comes with top quality home security systems. The installation of electric fencing in Gauteng is one of the methods of protecting both the inhabitants of the home and their precious assets in a province that continues to suffer from high levels of crime. Most homes in Gauteng have electric fencing for safety and security reasons and the installation of this fencing is seen as a prerequisite by many for living in the province. The installation of electric fencing in Gauteng also leads to lower insurance premiums on household contents. Electric fencing is both cost effective and easy to install, although it is preferable to use qualified technicians to install the fencing as it can offer the usual challenges involved in the use of electricity where safety is an issue that should not be ignored. There are a variety of different electric fencing solutions that are available in Gauteng. Electric fencing can be fitted to the top of existing walls but there are free standing electric fences that do not require that a wall be present. The guiding principles in the installation of electric fencing is that the fencing should be high enough to deter intruders and that the voltage should be high enough to prevent any tampering with the electric fence. A siren is often fitted to the energizer which is part of the electric fencing solution and this siren will sound if any attempt to tamper with the fence takes place. There are other varieties of electric fence other than those used to protect private domestic dwellings that can be installed in Gauteng, and these include the electric fences that are used to control the movements of game on game farms, as well as the electric fences used to protect large complexes. These electric fences feature energizers for each zone of the electric fence, meaning that the failure of the fence in one zone does not affect the performance of the fencing in other zones. These types of electric fences can be connected to the control rooms of security companies offering armed response which allows for a quick response to fence failure or the presence of intruders. Companies like Secure All Security can offer a variety of different security solutions, including electric fencing in Gauteng. By contacting companies such as Secure All, home owners can be assured of the correct installation of their electric fencing security solution. Security Fence Installation Security Fence Installation Services In Gauteng Security fence installation doesn’t need to be a costly task. If you would like to tighten your security at your home or at work, take the time to consider the benefits of having an electric fence installed. With security fence installation the average electric fence will be erected at quite a high level so as to discourage intruders from trying to climb or arrange a way to get over it. The energisers are also usually linked to an alarm system that has armed response attached so as to ensure that added security is available at all times. When it comes to security fence installation it is vital that you seek out a company that can guarantee that the best materials are being used to manufacture your fence and that no short cuts are being taken to power or electrify the fence. Secure All Security has been involved in the manufacturing industry for many years and their experience in this field means that they are able to manufacture most of the materials themselves. This brings the price tag for security fence installation down to a minimum. Electric fences are available in various forms, including wall top electric fences, free standing electric fences and palisade attached electric fences. Whether you are looking to have a new electric fence installed or you are considering having your security fence upgraded, Secure All Security will have just the solution for you. With a friendly staff compliment and expertise in all things security related, you can expect to find that Secure All Security can provide you with more than just a simple security fence installation service. While based in Pretoria they are able to cater to the surrounding areas as well and are sure to provide you with a well priced service and product that offers absolute value for money. Security Fencing Security Fencing Solutions In Gauteng When it comes to security fencing, one needs to ensure that what they purchase is of the very best quality and made available at a most affordable rates. Security fencing can very often be slapped together cheaply and the only time you figure it out is when your security set up is compromised or your fence is tampered with. Secure All Security is a Pretoria based company that offers to manufacture, build and install security fencing that is absolutely second to none. Palisade and free standing fencing is available with the optional extra of having electric fencing attached. Each and every security fencing set-up can be custom made according to the client’s needs and specifications. You can even expect a Secure All Security consultant to be available to visit your premises and advise you on what type of fence are required and what it will cost you to have manufactured and installed. Secure All Security has experience in the manufacturing field which enables them to self manufacture many of the components used when making up security fencing. This means that the over all cost of their security fencing can be kept to an absolute minimum. Whether you are looking for a security fencing solution for your business or home premises, Secure All Security is able to tailor-make a product that will be able to meet with both your budget and needs. Their attention to details and personalised attention to each task certainly enables to produce phenomenal results and flawless security systems each and every time. Some security fencing, such as the electric fencing offered by Secure All Security, is attached to an alarm and armed response to ensure that back up security is available should any tampering occur.